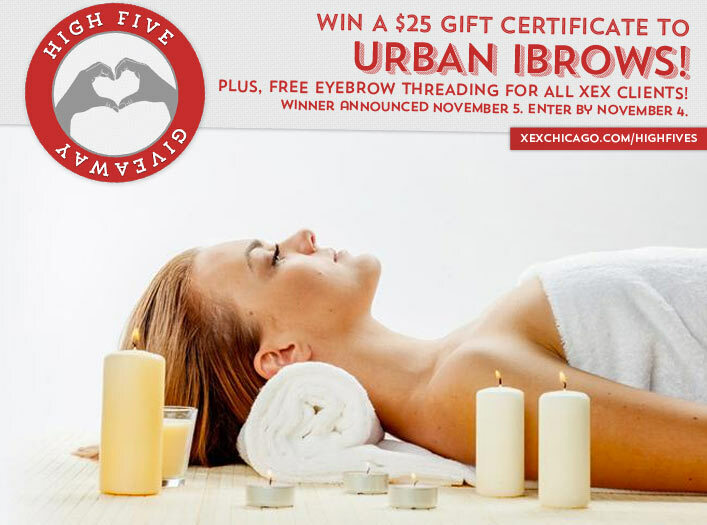 Win a $25 Gift Certificate to Urban iBrows! Plus a Free Eyebrow Threading for All Clients! Congratulations to Betty Dietz on winning our 139th High Five Giveaway and thank you to all who entered! Our next High Five Giveaway is for a $25 gift certificate to Urban iBrows. Urban iBrows are our new neighbors in the Leo Burnett Building. To say “Hello” to all of our clients, they are offering everyone a free eyebrow threading from now until November 5 as well! To redeem the free eyebrow threading offer, simply stop in or call Urban iBrows at 312-265-0281 and mention that you are a client of XEX. How many XEX Rewards points do you get for each hair service? Now, just add a comment to this post with the right answer to be eligible to win! The winner will be announced on Thursday, November 5. Entries must be received by midnight on Wednesday, November 4. 800 points for each hair service!